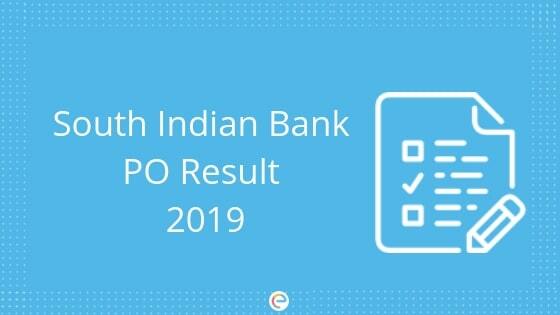 South Indian Bank PO Result 2019: The South Indian Bank PO result got released on 10th January 2019. Candidates who appeared for the exam can check their result on the official website – southindianbank.com. The South Indian Bank Probationary exam is conducted for the recruitment of Probationary Officers in the South Indian Bank. The vacancies are available in the states of Kerala, Tamil Nadu, Delhi NCR, Andhra Pradesh, and Telangana. In this article, we will give detailed information regarding South Indian Bank Probationary Officer result, how to check the result, the expected cutoff, etc. Read on to find out. The South Indian Bank Ltd has not yet released the total number of vacancies for the post of Probationary Officers. Embibe will update you as soon as the number of vacancies is released officially. Step 2: Click on “Careers”. Step 3: Click on “Recruitment of Probationary Officers”. Step 4: Click on “Online Test Results”. Step 5: Enter the required details – State Applied For, Registration Number, Roll Number, and Date of Birth and click on “Submit”. Step 6: Merit List will appear which will contain the Roll Number and Name of the Qualified Candidates. Search for your Roll Number. Step 7: Download the PDF and save it. Take a print out as well for future reference. Candidates who clear the written exam will be called for Personal Interview. Call letters for Personal Interview will be issued on the South Indian bank official website. Based on their performance in the Interview, the final selection will be made. However, an appointment will be given based on document and background verification, medical fitness, etc. At Embibe, you can take free banking mock tests for both clerical and PO exams. Embibe also provides a detailed analysis of the tests which helps in score improvement from test to test. Selected candidates will be given a probationary period of 6 months. Candidates will have to sign a contract that they will serve the South Indian Bank for a minimum period of three years. In case they do not serve the bank for the said period and leave before that, they will have to pay Rs 75,000 as compensation. We hope this detailed article on South Indian Bank PO result helps you. For any query regarding South Indian Bank Probationary Clerk result or the exam in general, feel free to drop a comment below. We will get back to you.